The AOS – T Side Table is designed and made locally by Brunswick (Melbourne, Victoria) furniture designer Nicholas McDonald of Made by Morgen. The table top of the side table can be crafted from sustainably sourced solid American oak or stylish Carrara marble as standard to meet any design expectation. 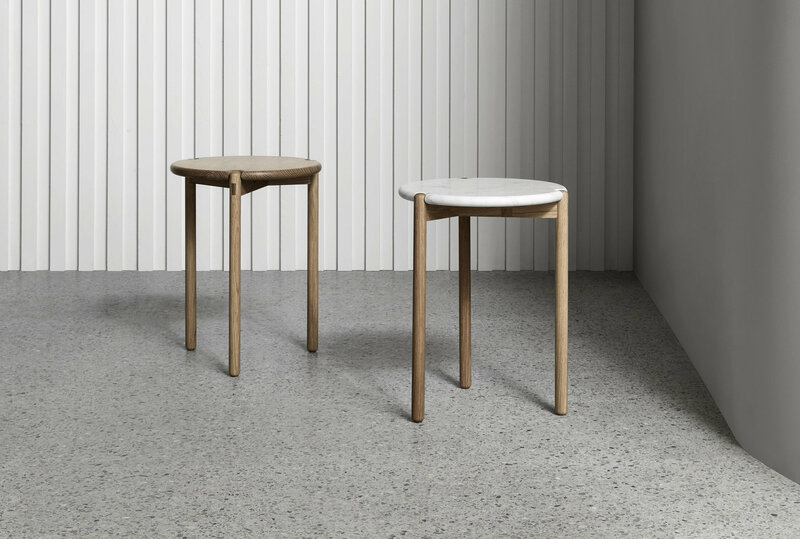 Made by Morgen places incredible emphasis on the use of finer materials that enhance the minimalistic style, recycled timber, sustainability and ethics that drive the design direction of his work. As a result this bespoke contemporary table is entirely environmentally sustainable. Made by Morgen understands that all design needs are unique so this piece is completely customisable according to materials, dimensions and finish. Contact The Local Project to talk through how the AOS – T side table can meet your individual design needs and requirements. The Made By Morgen team draw inspiration from mid-century Danish and Scandinavian design. Nicholas and his team work by hand to create individual, bespoke and unique furniture products for places and spaces. Made by Morgen maintain traditional workmanship and quality, sourcing product materials that support their high standard. An in-depth understanding of the history of furniture materials is applied to ensure not just a substantial outcome, but one which tells a tale within the handcrafted product. Nick sees it as imperative that they support their local community in Brunswick, and always ensure that he and the team only used sustainably sourced product materials such as American oak and quarried marble. See Made By Morgen’s ‘The Local Project Profile’ and view Nicholas McDonald’s catalogue of Scandinavian and Danish-inspired furniture products that are available on The Local Marketplace. The lead time of the AOS – T Timber or Marble Side Table is 10 – 12 weeks. For fast-tracked delivery of this the AOS – T, or any other product on The Local Marketplace, contact the team on marketplace@thelocalproject.com.au – we will attempt to arrange an earlier lead time for the chose furniture product(s) to be completed and delivered. Please note, in some cases, fast-tracked delivery may incur an additional fee. The AOS – T by Made by Morgen comes with a 5 year structural warranty.